First an apology.... this report is well overdue. I completed this flight in November last year. 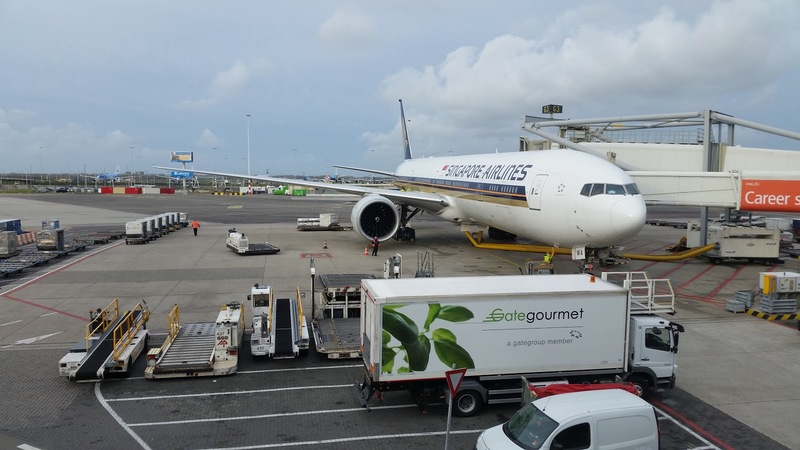 This is Singapore Airlines flight SQ323 from Amsterdam to Singapore. Currently a B777-300ER route but it will soon feature the brand new Airbus A350 instead. When that change is completed then Amsterdam will lose First Class service from SQ. This flight departs Amsterdam daily at 10.25am, arriving in Singapore at 5.55am the following day. On my flight the aircraft operating the service was 9V-SWA, 9 years old at the time of the flight. I believe it was the first -300ER in the Singapore Airlines fleet. It's still flying in the same interior configuration now as it was when it was delivered. Despite the age of these seats, they are still market leaders in terms of their size! I managed to snag bulkhead seat 11K, in the mini cabin behind First Class. Row 11 is coveted due to its additional leg room area, the full width of the seat is available for your legs in this row. Because of this there is little difference in the size of the seat when compared to First Class. 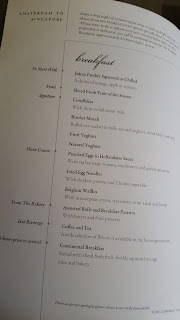 After settling in I was brought some champagne and the menus. We departed on schedule and departed into the cloudy skies. Bottled water was handed out along with individual packets of eye shades, socks and slippers. A separate amenity kit is not provided on SQ business class, instead all your toiletry items are available in the lavatories. I made use of the in seat USB power to charge my phone. I ordered a Singapore Sling for my after takeoff drink and it was promptly delivered with a smile. A short time later the satay service commenced. The turbulence did not last too long. Soon the rest of the meal service commenced. The linens were laid and tables set. I was disappointed that SQ are using stemless wine glasses like many carriers seem to now. Breads followed soon after, I chose the garlic bread and a bread roll. 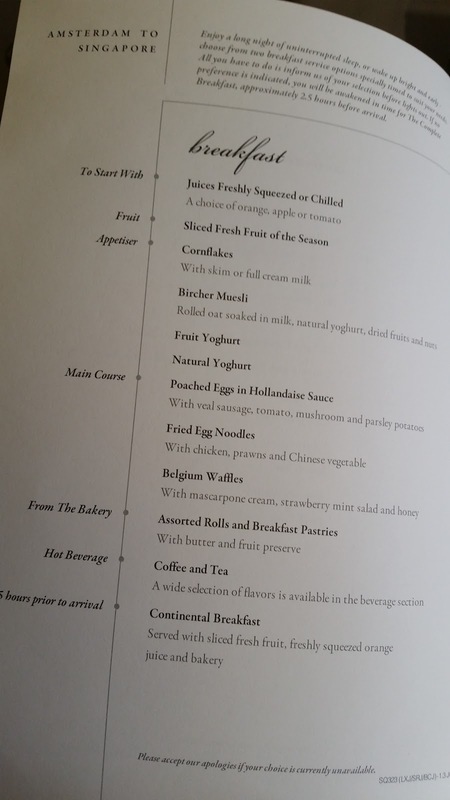 Singapore Airlines have a large selection of pre-book meals available to business and first class passengers. 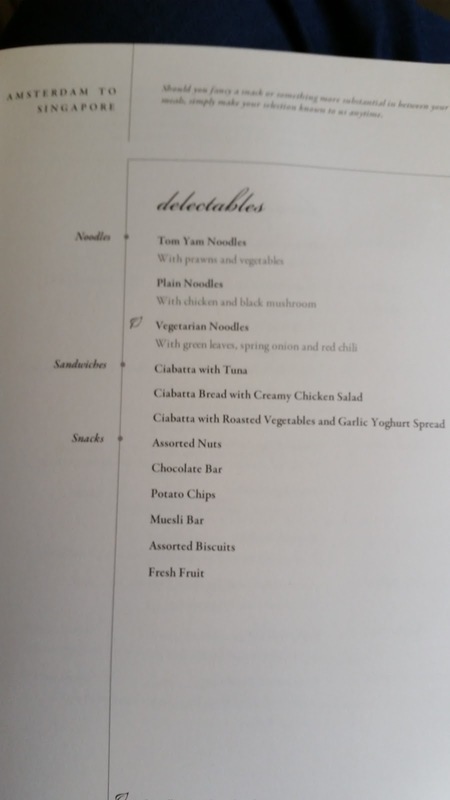 On this flight I had used the 'Book The Cook' service to order the duck breast with noodles. I found it tasty and very filling. 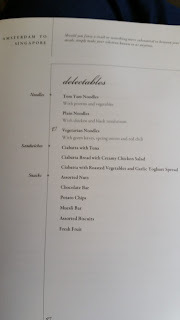 It seems Singapore Airlines offer dessert before cheese, so next up was the cheesecake. Nice presentation and delicious taste! To finish this gigantic meal, the cheese and fruit came out on a trolley. You could choose what you wanted to have. Service throughout the meal was great with plenty of drink top ups available. I was so full afterwards I had to have a nap. These seats need to be flipped over to be set up in bed mode. The back of the seat folds down to provide a perfectly flat service with a mattress topper on it and a comfortable blanket. 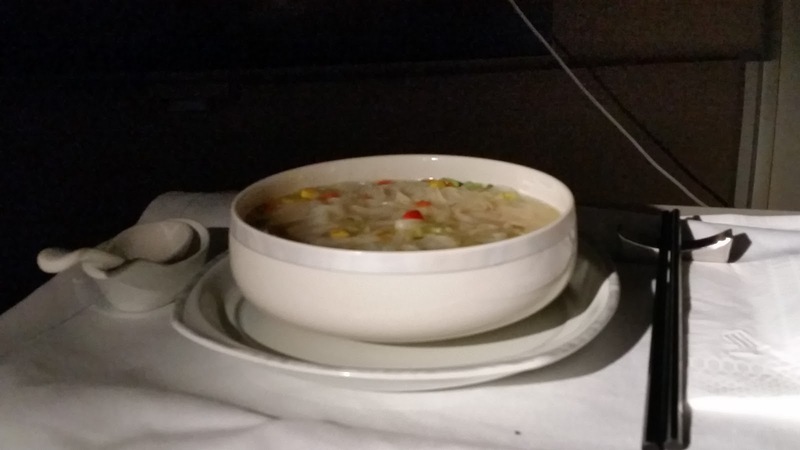 After a nap and halfway through the flight I decided to order some chicken noodles. I spent my time napping and watching shows on the Krisworld system. Soon enough it was time to get up for breakfast!! First up, bakery and fruit. Next, bircher muesli and a cappuccino. The cappuccino is quite a poor version. Nowhere near as good as what Virgin Australia have on the A330 fleet. Unusually for me I ended the meal with a sweet main course, waffles. I normally go for the egg dish but decided to do something different this time. I didn't think the waffles were particularly great though. They seemed tough and dry! I think I'll go back to the eggs next time. After just under 12 hours in the air we made a pre-dawn arrival at Singapore Changi airport and parked at T3. I headed off to the lounge for a shower and to wait for my connection to Melbourne. Despite the age of the on board product on these 777-300ER's, I was completely comfortable and very happy. I don't think you will find a wider seat around, they are simply huge. 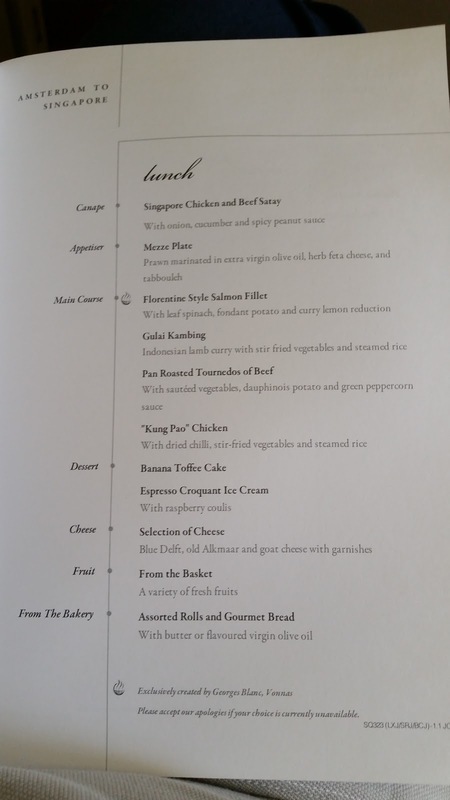 The onboard service and quality of the catering is still wonderful on Singapore Airlines. 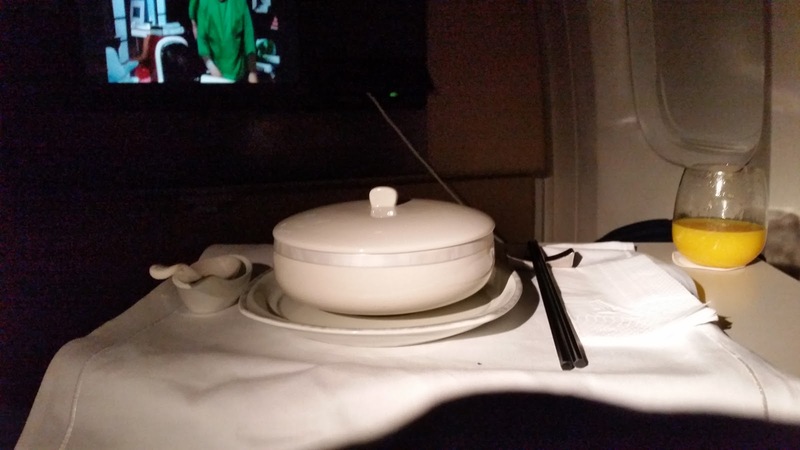 It's probably as good as some airlines First Class product. 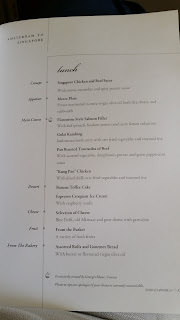 In fact I think I am so satisfied in 11K on this plane that it would almost be a waste to pay the extra points or cash for first class (almost!). The large seats look amazing and the duck meal almost as big! I must admit I had never flown on them in all this time and I was perfectly satisfied! 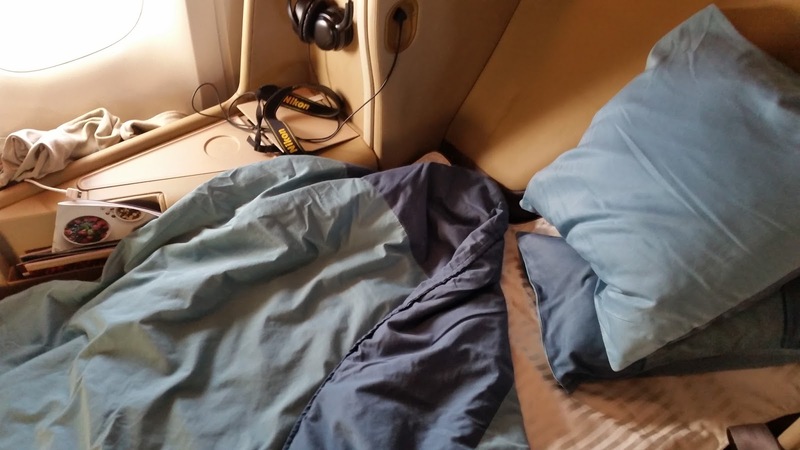 Am I the only one that thinks that SQ's seat in bed mode is really uncomfortable? You have to sleep on an angle, the flip over bed is like sleeping on an army cot with not enough padding with metal bars sticking into you, I found the padding to be woefully inadequate and the general experience not good. Lovely sense of space around you but then you are force into the is cramped uncomfortable angle to sleep or in my case try and sleep. I've flown them in business 5 times and I love the soft product, the food (except out of Moscow, yuck!) lounging in the high seats with the 2 pillows and watching the amazing selection of tv and movies is great, but the bed is a real disappointment for me. Some airlines offer matters pads I think that is something SQ should consider. Great trip report love your videos as well! In row 11 and the other bulkhead row (I think 18?) there is no narrowing of the seat around your legs so thats solved.